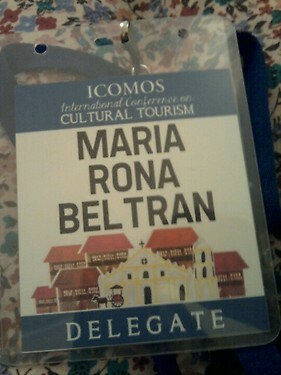 The ICOMOS International Conference on International Tourism is the reason why I am back to Ilocos. If you ask me personally I will whisper you my answer "the durong (malunggay flavored) pandesal, poqui-poqui pizza and vigan longganisa"! Held in Ilocos Sur Provincial Capitol, I praise the management because of the excellent free wifi for me because I literally live online. Sandra Millar, ICOMOS President International Cultural Tourism Committee reaches out to the audience to "involve more young people for not only heritage is for old people but for the future generation ". She also gave a hint of what is the next world heritage of the future could be a place in Canada where people are engaged into break dancing knows? Augusto Villalon, President of ICOMOS Philippines explains the Intramuros Master Plan on the problem about informal settlers (squatters) community that is an eyesore. It is all about making the problem a solution. First is a resettlement area that is 2 hours away from Intramuros and a free ride back to those who need to work back in the area. Second is to build them houses that bears the design of "unique Filipino architectural style" of old houses we see in Intramuros itself, Vigan, Iloilo, Bacolod and the rest of the country. Philipine Tourism however cannot be explained in any way possible without acknowledging the cultural tourism aspect. Felipe de Leon, Chairman of National Culture and Arts challenges everyone on issues about erasing Asian memories instead of instilling local identity of the place like why is Legazpi City named after its colonizer and not the local chieftain who earlier founded a "government" in the place? On the second day another one also asked why is it that Plaza Salcedo in Vigan was also named by another "colonizer". It is like asking why our country is named after the king of one of our colonizers. DFA Assistant Secretary Fariñas calmly answered the question these issues of the past that we need accept as part of our Philipine history. What we need to do is move on and focus on the present. Why call these old houses of "unique Filipino architectural style" NOT the usual "Spanish houses" we are used to? There is a dissertation study by a Spanish native himself, a former director of Instituto Cervantes Manila - a Spanish language School from Spain and which yours truly was a former student. I will research about this soon and make a blog post separately. Why Vigan was the only Spanish colonial town spared during WW 11? Because of a love story. It is about a local woman, Belen Castillo and a Japanese general, Maj. Sakae Narioka who got married and had kids. During the World War II when the Japanese comrades are already losing against the Americans, they were ordered to leave and bomb every city or town they are stationed. But because Narioka loved his family, he asked his fellow soldiers not to destroy the place. His family remained safe but he was killed in the battle.